Infra Red Wild Life Detection beam circuit. Approx 2 metre range beam using remote IR led transmision. Camera power switching with reed relay for 20 sec recording when beam is broken. IR receiver has a focused beam for the IR detector. This circuit uses an LF353 op amp plus five ZVN 1306 n channel mos fets to act as 50 Hz clock generator and IR receiver pulse amplifier. The IR Leds are pulsed at about 0.5 mSecs at 100 mA running at 50Hz, the received pulse signal being amplified by 70 dBs to maintain the output relay in the off condition until the beam is broken. When the beam is broken the camera will operate for 20 seconds while the IR transmission is disabled. The IR transmission Leds are mounted inside a focusing silver cone to aid a narrower stronger output beam, similar to a torch reflector. A twin insulated thin cable is used for remote siting being at least 3 metres long. An IR filter block is made from translucent red acrylic 26 mm cube which passes the signal to the IR receiver transistor. This block has a 12 mm radius as viewed from above to aid in focusing the received signal. Depending on orientation the received beam will be wide in one direction and narrow in the other. If you are manually adept, this could be made semi spherical to focus the incoming beam from all directions. Positioning the IR receiver at its focal point about 5 mm from the filter radius is best done by trial & error while watching the output indicating led. 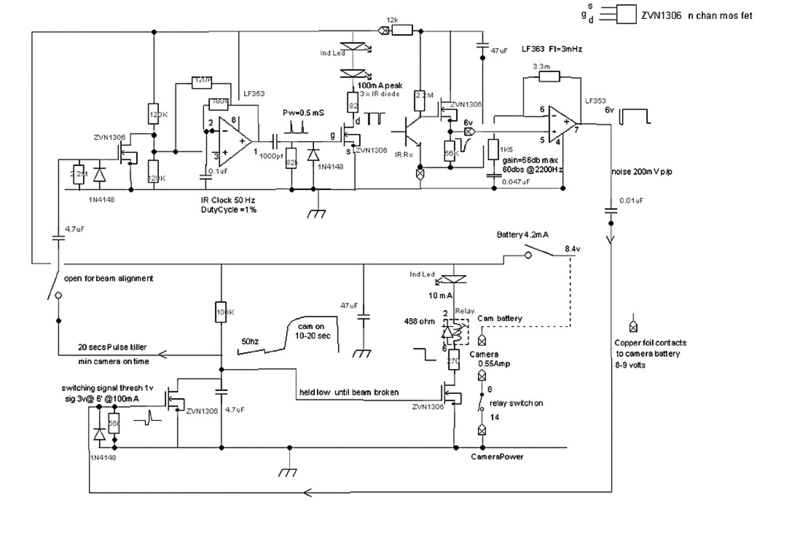 Focusing the received signal will enable greater distance between transmitter & receiver. The cassette camera has been found to boot up in the record mode when the battery power is applied, if the camera power switch is preset in the record on position. This can be checked by inserting the battery pack with the record red button pressed. While the camera has auto focussing and auto light level sensing, the record button needs to be pressed seperately. The camera is therefore mounted in an external box and the record switch is kept depressed by a light pressure applied with a wedge between button and outer case. A shaped foil conection is placed over the negative terninal contact of the removable battery pack and then has an insulating tape applied over it. A second foil conection is placed over the insulating tape such that when the camera battery is in position the camera will power up when the foil contacts are connected. The thickness of the foil connections and insulations should be less than a millimetre so that the battery pack will fit properly. Contact wires from the two foil connections are fed to the reed relay switch. 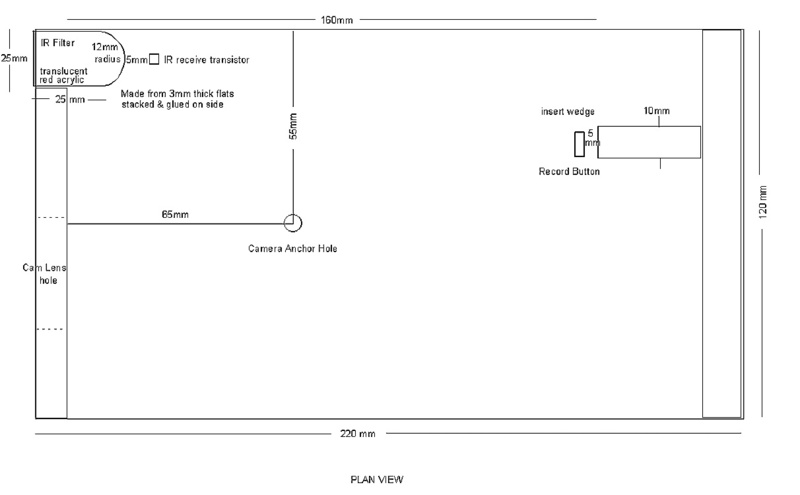 Because the camera battery is not connected until the relay operates there is no chance the camera will not operate when needed. However, It would also be possible to connect to the battery positive terminal using a foil connection and this could then power up the control circuitry using the unswitched positive & negative foil connections.